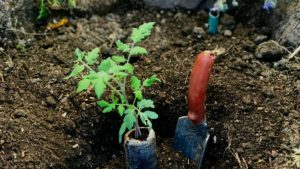 Home » Blog » Start a Veggie Garden: Quick, Simple, Inexpensive and FUN! Nothing like a tasty, garden fresh harvest! 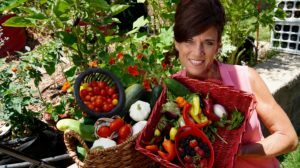 I love to grow my own fresh, tasty veggies – it’s so much fun grocery shopping in the backyard for dinner! Does this sound familiar? Then you’re in the right place! ANYONE can have tasty, healthy food growing in their own backyard or patio. What’s more, it CAN be done in a quick and simple way without breaking the bank! The best part is, it’s a ton of FUN, and you’ll feel so much pride knowing you are growing your own fresh, health food! 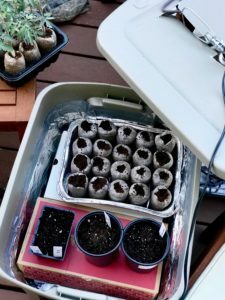 Starting a garden from seed is quick and saves a TON of money! Let’s begin by starting some seeds indoors. It’s quick and simple can save you a TON of money. When you start your garden from seeds, you won’t have to buy transplants at the garden center. Growing from seed also opens up a whole new world of unique, flavorful veggie varieties. You might be wondering why start seeds indoors? 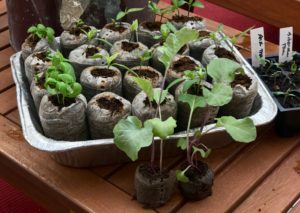 By getting your seedlings going inside 4- 6 weeks before your last frost date, as the weather warms up, you’ll have your own transplants to put into the garden. This gets your veggies growing faster than you would if you waited to put seeds in the ground, – this means your own fresh, tasty veggies on the table sooner! Even if it’s warm enough outside to start seeds directly in the garden, starting some seeds indoors gets the seedlings off to a quick start in a protected environment – again putting food on your table quicker! The first thing you will need is some seeds. If you need seeds, a great place to start is with my Spring Garden Seed Collection. 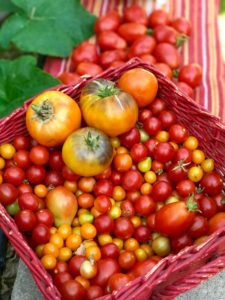 I’ve personally selected these seeds because they are easy-to-grow, classic veggies like lettuce, cucumbers, tomatoes, peppers, basil, onions, peas and kale. You’ll have 12 seed packets – everything you need for a basic veggie garden! Starting seeds is super quick with peat pellets. My favorite way to start seeds indoors is to use 3 inch peat pellets. These are compressed pellets of soil that expand when you add water in which you can plant seeds. Peat pellets are inexpensive, and provide a super quick way for gardeners with a busy schedule to get started. It’s a piece of cake to start your seeds this way – because it doesn’t involve getting your house messed up with bags of potting soil and it’s super speedy. Just add water, fluff up the pellets, and add your seeds. It’s a fun project to do with your kids – get the whole family involved! Follow the directions in this video, “How to Start Seeds for Your Spring Garden” so you know exactly what to do. It takes about 5 minutes to get seeds started, it really is THAT easy! I love to check my seedlings daily, sometimes several times a day. It’s always an exciting moment when I see the seeds poke through the soil – that’s when I know I am on my way to eating my own fresh veggies very soon! I can’t wait for you to experience this feeling of excitement and pride! Make a grow light box (easy) for your seedlings. For your indoor seedlings to grow healthy and strong, you’ll need to provide it with a grow light. Don’t be intimidated by getting indoor grow lights set up. The mantra here is “keep it simple”! I like to use a simple grow light box made out of a plastic storage bin, a clip light and a special grow light bulb. It’s super easy (and very inexpensive) to make. Watch the video “How to Make a Grow Light Box for Your Seedlings“, it’s quick and easy to make and you’ll feel super confident that YOU GOT THIS! Water seedlings from the bottom when the top turns a light brown color. 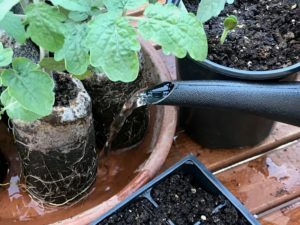 Keep an eye on your seedlings to see if they need water. If the top of the pellets turn a lighter color, give them a drink. Pour water slowly in the bottom of the pellet tray until the they turn a dark color again. Your seedlings will need a small dose of liquid fertilizer once they get a few inches tall. 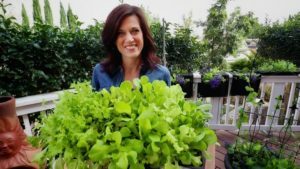 This video, “How to Water and Fertilize Vegetable Seedlings” shows you exactly how and when to do both (and what to fertilize with) so your little babies grow into healthy veggies that you can plant in your garden! Transition seedlings gradually to the outdoors. Transplanting Seedlings Outside After growing indoors for about 4-6 weeks, your seedlings will be ready for the outdoors! Transition them slowly outside, putting them in the sunlight for a few hours each day, slowly increasing the time they are outside. This process is called hardening off. Watch the video “How to Transition Seedlings to Outdoors” so you know how to get them settled in to their outdoor home successfully! Plant seedlings outside after the last frost date. Once the danger of frost is past, transplant your seedlings in the garden. Prepare your soil by loosening it up, and adding plenty of organic material, such as compost and worm castings. Dig a hole a bit deeper than your seedling, put it in the hole, fill in with soil and be proud of yourself for starting your garden! 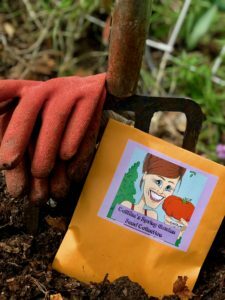 Watch this video “How to Prepare Your Garden Soil for Planting Veggies – 3 Easy Steps” and “Planting Seedlings in Your Vegetable Garden” for all the fun details! The taste of garden fresh tomatoes can’t be beat! Jump in – Go for it! Now what I want you to do is get some seeds started – it’s not too late! Pick up a Spring Garden Seed Collection and jump right in. Before you know it you’ll be harvesting your own fresh, healthy veggies – you’ll be so glad you started those seeds! 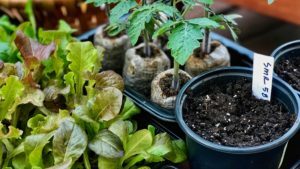 It’s quick, simple and inexpensive to grow your own food – grow what you love to eat, and make sure you have plenty of fun along the way. Deal? Comment below – let me know if you’re starting a veggie garden for the first time and what you’re looking forward to growing! Happy Gardening! Hi Kim! Its that time of the year again! Im so excited! I wove in zone 6 in New England, Specifically in Stratford. I just have a quick question for you is it OK to use some sand from the beach the one is try to have no salty water? Just as a drainage material, I was wondering because specifically in Stratford. I just have a quick question for you is it OK to use some sand from the beach the one is dry I have no salty water? Just as a drainage material, I was wondering because is Rich in minerals and he might be a beneficial thing for the plants. Also, I have a question about my seeds, I was just wondering how long can I keep my se rich in minerals and he might be beneficial thing for the plants. Also, I have a question about my seeds, I was just wondering how long can I keep my seeds? Do they have an expiration date? Because I noticed that I bought non-GMO organic seeds and it was plenty so I did t used them all last year and this year when I planted my seeds some of them didn’t germinated this year but last year with the same seeds I grew a beautiful graden of veggies. Please let me know and thank you in advance. Your videos are awesome! I’m not really sure. I’ve never used beach sand bc of the concern of introducing too much sodium into the soil. Sand in an excellent drainage component for soil but I would use a sterile sand though I encourage you to do a bit more research into it. Hope this helps! Hi CaliKim, I buy groceries at Winn Dixie whatever I could afford and I would love to grow vegetables in my yard to save my money. How can I purchase your grow bags? I planted a zucchini plant last week in a clay pot I had sitting around. And today, I was terrified because the weather was going to be awfully HOT!!! And there on YouTube, this morning the very first video in the whole site was your 2 hour old video on how to take care of your plants from extreme heat! That was so grand, and I thought, “Did she read my mind? or something! I have started planting things here in my little patch of dirt and also, my enclosed patio. You have shown me that you can grow stuff in small spaces and be happy and industrious doing it! Somehow, a cherry tomato plant has been growing in a part of my dirt patch. I think it’s magical because I didn’t plant it, but, it’s growing and yielding a nice crop. Thanks for showing me stuff that I can do and soon, I should have more plants growing in my magic garden!!! Should I (do I *need* to) use the plastic greenhouse domes that come with my peat pellet kit? It seems awefulyl hot and moist in there. I’ve got tomatoes and peppers planted and waiting for them to sprout.